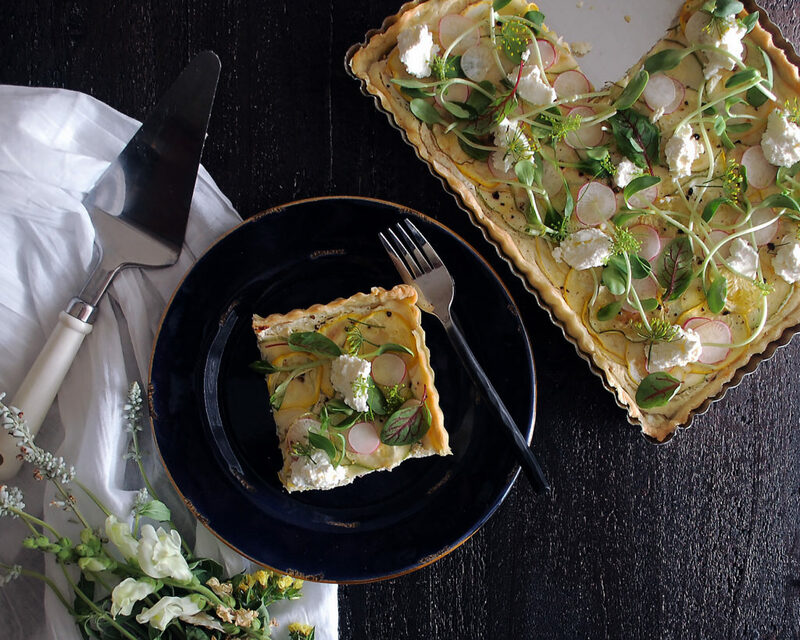 A simple tart with homemade dough and fresh, vibrant summer squash. I really, really am loving savory tarts. Back during the springtime, I made one that consisted of peas and asparagus. I never got around to writing the recipe for it, so I decided to make it again, just this time using the produce of late summer (aka really beautiful green and yellow summer squash). If you’re intimidated by making homemade pie dough, don’t be. It is such an easy process, and I’ve gotten the recipe down so that it is as simple as can be. It’s mixed in the food processor, and the only real secret is to use very cold, cubed butter. This will create a flaky dough. Once the dough chills for an hour, it gets rolled out and placed right into the tart pan (I found the perfect rectangular pan from Williams Sonoma with the most gorgeous crimped edges). It’s important to par-bake the dough first to ensure a crispy crust. From there, it’s a simple ricotta filling that I sweetened with just a touch of honey. I like lots of freshly cracked black pepper, too. I then shaved the summer squash into beautiful, thin circles and placed them right on top of the ricotta filling, making sure to lightly press them down into the cheese. The best way to serve this tart is slightly warm or at room temperature. I would not suggest eating it straight out of the oven or chilled. 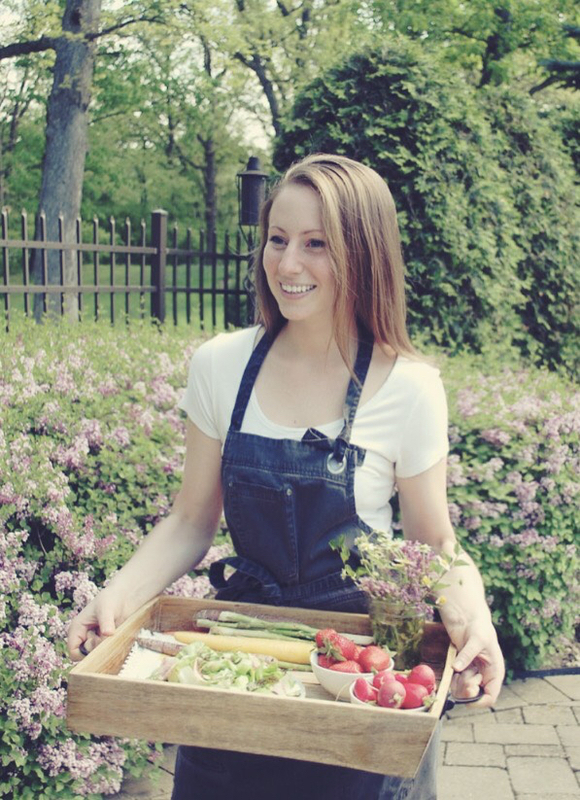 And the garnishes…well those are my favorite part. I shaved some crisp radishes over top, along with a little extra ricotta cheese. On each dollop of cheese, I like to sprinkle a little salt so that the fresh flavor comes through. 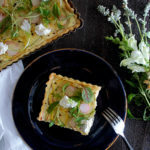 I had also found some beautiful dill blossoms, sorrel leaves, and sunflower sprouts at my farmer’s market for the top of the tart. But really use any type of herbs, greens, etc. that you’d like. And for the finishing touch, just a drizzle of truffle oil to take it over the top! 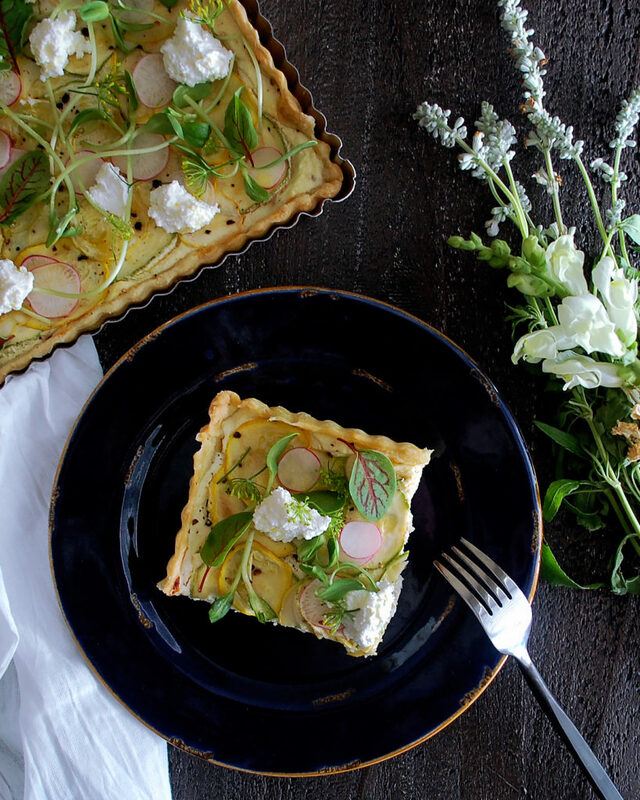 So, I hope you run to the market, find the most beautiful summer squash, and enjoy this delicious tart! Cheers! Combine the flour and salt in a food processor and pulse until incorporated. Add the butter and process until the mixture resembles coarse crumbs. Slowly drizzle in the water, with the processor running. The dough should begin to pull away from the sides as it forms. Turn the dough out onto a lightly floured surface and shape the dough into a ball. Wrap the dough with plastic wrap and refrigerate for at least 1 hour. Preheat the oven to 375F. After an hour, let the dough sit at room temperature for about 10 minutes to soften slightly. Roll the dough out so that it’s about 1/8” thick. Gently lay the dough into a (11 ¼” x 8 ¼” x 1”) tart pan. Press the dough into the pan firmly. Trim off the excess dough and reserve for another use (it freezes well). Use a fork to prick small holes along the bottom of the dough, about 1 inch apart. Then, line the inside of the dough with a piece of parchment paper. Fill the pan with pie weights (dried beans, rice, or popcorn kernels all work well). Par-bake the crust for 8 minutes. remove the parchment paper and pie weights. Set the crust aside as you make the filling. In a mixing bowl, whisk together the ricotta, honey, and beaten egg. Season with salt and freshly cracked black pepper. Pour the mixture into the par-baked crust and use a spatula to smooth it out into one, even layer. Lay the shaved summer squash over the entire layer of ricotta, gently pressing so the squash slightly sinks into the filling. Drizzle the squash with a little olive oil and season well. Drop the oven temperature to 350F and bake for about 20-25 minutes until the filling is cooked through and the squash is golden. Let the tart cool slightly. Serve warm or at room temperature. 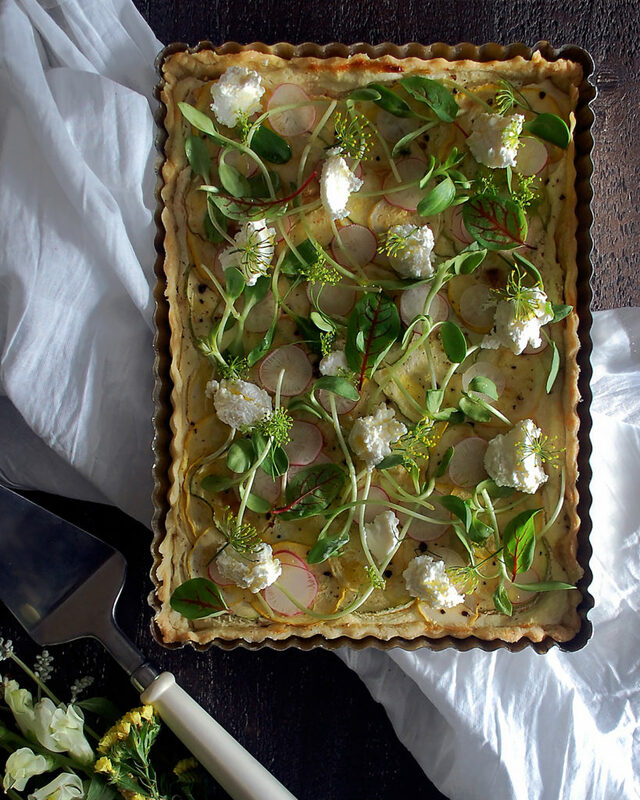 When ready to serve, top the summer squash tart with the shaved radishes and small dollops of ricotta cheese. Season each dollop of cheese with a small pinch of salt. Garnish with a few dill blossoms, sorrel leaves, and sunflower spouts. Drizzle the truffle oil over top.